Banoffee Pie may sound complicated but it is one of the easiest British desserts to make and also one that got me liking bananas. I don't quite like that fruit, I'm more of a berries, raisins, cherries, blackberries, strawberries, sultanas, pomegranates person. Did I mention strawberries? 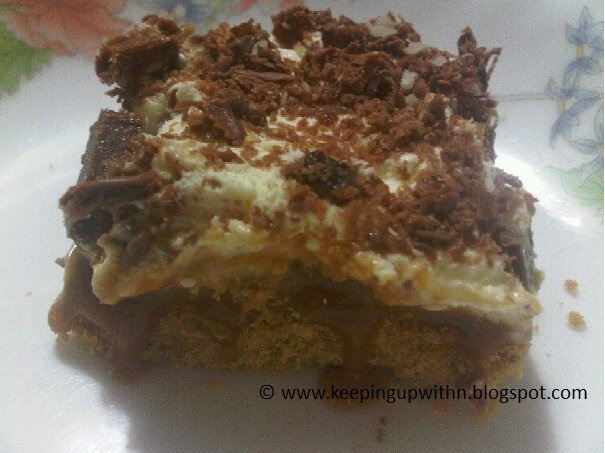 So a banoffee pie is primarily made out of bananas, cream, caramel and to make it interesting- chocolate is used as topping. The only trouble I had was finding a jar of ready-made caramel. In Dubai, the brand Nestle does not stock its popular Carnation Caramel and I don't know how to make caramel at home although there are several instructions that came up when I researched a how-to. So I scoured Dubai for ready-made caramel, spoke to friends, colleagues, even asked an SMS based service that answers all questions (The Question Company) but in vain. Yes, I tried Marks & Spencer as well and nothing. After days of searching and almost giving up, I *finally* located it at Carrefour Express. It was hiding among other jams bottles and ready-made spreads. There are some recipes that ask for the baking of the crust of the pie etc etc. I found an alternative to that. - Crush the cookies and mix with the butter. Press them into the base of the tart tin and keep it in the refrigerator for about 20mins or until it is set. - Spread spoonfuls of caramel onto the base until it is covered (a thin to medium layer of caramel should do just fine). Place it in the fridge for about 45mins to an hour. - Once the caramel has set, cut the banana and top the slices over the biscuit and caramel base. Spread the whipped cream over the banana slices. - Top this with chocolate shavings. P.S. Again- this was the only (blurred) pic I could take before chowing it down.